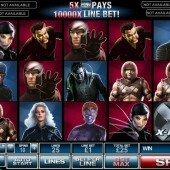 One of the most popular games from the Playtech Marvel series of slots is this game based on the Hollywood adaptation of the Marvel comic, X-Men. A 5-reel, 25-payline slot, it comfortably joins other titles such as the popular Iron Man, Daredevil, Elektra and Blade in terms of competent Marvel-themed games, and there's even a 10,000-coin jackpot to be won in the game if you line up five Wilds on a winning payline. But does the rest of the game do it justice? Let's take a look and see if X-Men is more superpowers than mutant misfit. In actual fact, X-Men is based on several of the films in the Hollywood series. Therefore, you get images of characters like Wolverine (X-Men, X2 etc), Lady Deathstrike (X2) and Juggernaut (X-Men 3: Last Stand). As with games like Fantastic Four, the graphics are more characterisations based on the actors rather than actual photos, but no matter - you get the idea. The game, however, does have a very good bonus round which is triggered when you get three or more scatters (X-Men symbol) on any reel. This initiates the Heroes mode, with unlimited free spins available. The bonus round flips between this and the Villains mode, with only 8 free spins. Eventually you run out of free spins in the Villains mode and it stops, but you do on occasion get a lot of free spins. Each winning combination is paid at 2x multiplier and 5x when the right symbols appear on Reels 2, 3 and 4. 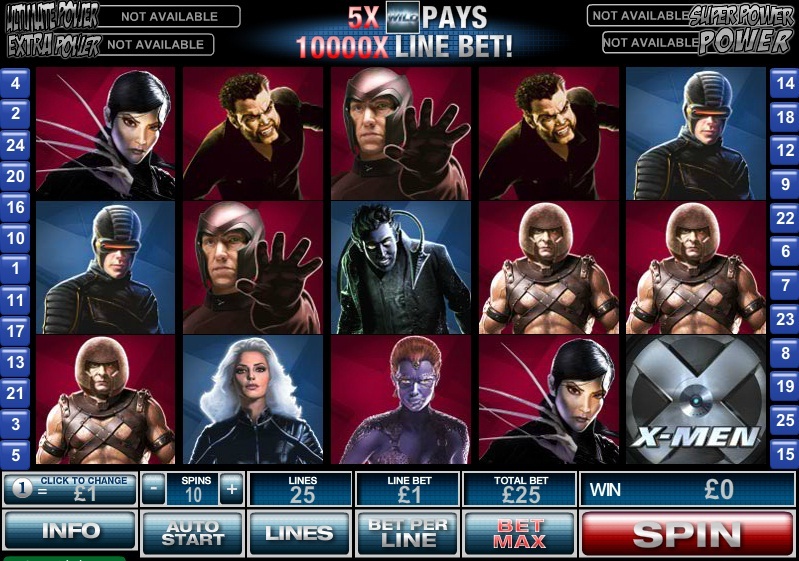 I have played X-Men slot several times on trips made outside the US and it is not as graphically stimulating as some of the movie themed Playtech slots, such as Gladiator online slot, King Kong and The Hulk. These all feature actual clips from the movie, which surprisingly X-Men does not. Having said that, X-Men is a very entertaining slot and one of the better ones from the Marvel series. It is right up there with Iron Man 2, featuring Tony Stark and Fantastic Four video slot for playability.